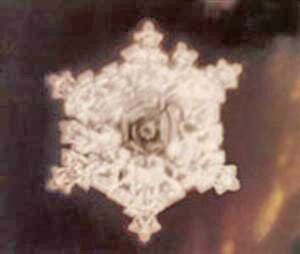 The son of Dr. Emoto was present and served as the translator. E: Five years ago, an asteroid that carried ice came down to earth. Researchers from the University of Hawaii measured it and found that it weighed 100 tons. Each year tens of millions of such large pieces of ice fall to earth from outer space. If we calculate the amount of water that they carry, people will see that it is very possible that the water on earth originally came from outer space. Researchers from the University of Hawaii said that maybe at the beginning there was no water on earth and the water came to earth from outer space. Many scientists and researchers don’t agree with this theory, but I believe that it is correct. But we still remain on this earth and keep being reincarnated. We can’t continue being incarnated like this. We must graduate and go back. We the human beings are just like water. We need to go back to other planets. “Dr. 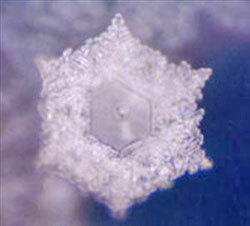 Emoto did experiments with water by putting two notes on a bottle of water. One says, “Thank you!” Another says, “You are dumb!” The water formed beautiful crystals, which proves that “Thank you” triumphed over “You are dumb.” That is why Dr. Emoto is trying hard to find 10% of people on earth who have righteous thoughts. The water crystal experiments carried out by Dr. Masaru Emoto in Japan were published in newspapers and have produced enthusiastic response among readers. We subsequently interviewed several people in scientific circles and invited them to talk about the significance of the experiments. Below is an interview with physicist Dr. Cheng Luojia. 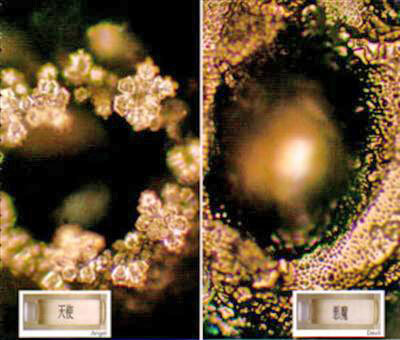 Zhengjian Reporter: In your opinion, what is the most unique thing about the water crystal experiments carried out by Mr. Emoto? Dr. Cheng Luojia: The experiment is pretty simple. It demonstrates the differing ways of water crystallization in different situations. It is rare to have an experiment that is this concise, intuitive, and easy to understand, and that in itself is a huge accomplishment. This experiment deals with an extremely immense and important subject, namely how people’s minds influence matter. Not too many experiments have been done in this area. The relationship between matter and mind is a topic that has been debated for a long time. Being able to explore the relationship between the two using such a simple experiment is very meaningful. In addition, the original photographs of the experiments are enlarged 200 to 500 times. The observations have actually reached microscopic levels, that is, it is observing microscopic planes instead of points. This is rarely seen in scientific circles. I believe observation of the whole microscopic plane will bring forth a brand new world to us. I think, both in terms of its subject and its research methodology, this experiment is a new beginning in science. Reporter: The results of the water crystal experiment have been published in detail in the two-volume book Messages from Water. Which parts have impressed you most? Dr. Cheng: The first picture in the book is an ice image, water in the frozen stage, about to melt into water, but has not yet become water. It represents a complete drawing of the Chinese character for water! 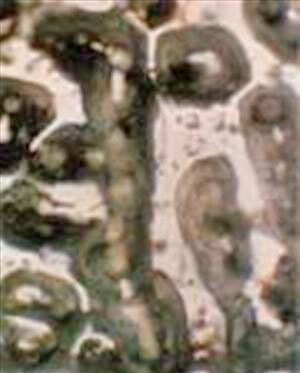 The ancient ancestors of the Chinese people perhaps already had the capability to see to the microscopic level. This (above) picture gives me a new understanding of Chinese pictographic writing. 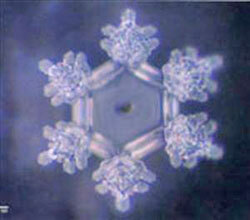 When the words “Love” and “thank you” are spoken to the water sample, the water crystals form a beautiful pattern. 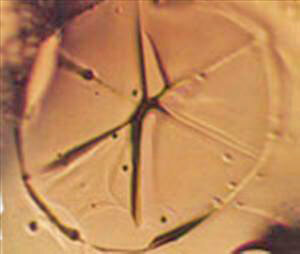 When the water sample was exposed to harsh, destructive words, the crystal formed is in chaos and without order. The contrasting results are amazing and are a direct reflection of the influence of people’s mind on matter. We used to think that people’s mind intent and spirit were metaphysical. They belong to a different category from matter, but this experiment has revealed an in-depth relationship between matter and mind. Furthermore, we are also able to see that good intent positively influences matter, and bad thought patterns make matter ugly. When you speak “beautiful” to the water, its crystal becomes beautiful. When you speak “dirty” to it, its crystal really looks extremely dirty. Looking at these pictures, a mother would probably understand that more encouragement and praise would make children become more intelligent and beautiful. A harmonious family atmosphere would also contribute to healthy looking plants in the house and help keep them beautiful. The enlightenment the public might gain from this experiment should not be underestimated. Reporter: This experiment has also tested how language, image and sound affect water. What is your view about the results? This indicates that it is not the individual word, the language in which it spoken or the sound vibrations that are the reason for the formation, but the inherent thought processes behind the language or meaning represented by the language that influences the water. The same meaning or the same information will produce the same effect, even though it is expressed in different languages. In this case of water, if we advance our thought a step further, that every word/thought produces a different shape, what conclusion can we draw? We can arrive at only one logical conclusion - the meaning of a word produces a shape! In other words, thoughts have shapes! Doesn’t that say mind is matter? Water is also very sensitive to images. After “reading” a lotus picture, a water crystal will grow unceasingly, as a lotus grows unceasingly. After “reading” a picture of a fir tree, the water will periodically change its color in the process of crystallization, as a tree undergoes changes, like its respiration process. More interesting yet is when water “reads” a picture of the sun or the word “sun,” the two crystals formed are identical in shape. This indicates that an image also possesses a kind of consciousness, a kind of information. The same as a word, it represents a kind of thought, but is expressed in a different way. Every kind of shape represents a kind of spirit. An ancient adage tells us that similarity of shape is similarity of spirit. This is one reason why a painting can express the artist’s thought and emotion and evoke those in the viewer. The capability of water of listening to music is more impressive. 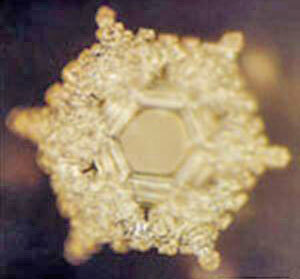 After water “listens” to a musical composition by Bach, the shape of a water crystal looks neatly organized and clear. 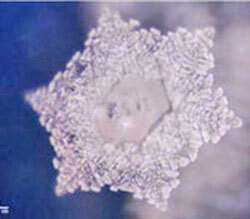 The shape of a water crystal looks clear and jubilant after the water “listens” to Beethoven’s “Pastoral” symphony. After “listening” to a nursery rhyme, water will become clear and pure. After listening to a musical composition entitled “Forest in the dim light of night,” the water crystal appears to be shrouded in the dim light of night. The dimness reflected in the crystal is not due to lack of light, but sound. Those results have shown that the sound and the shape of an object are interconnected. This really opens up a totally new world. The interconnecting relationship between the sound and the shape is an important new concept. For example, a good musical instrument must have a good shape. In ancient times, when casting a bell, an experienced worker would be able to know if the sound of bell was good or not with just a glance at the shape of the bell when it was taken out of the furnace mold. The influence of sound on shape manifested in this experiment is very vivid. 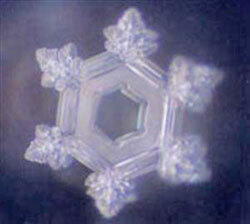 Reporter: Most people are initially surprised when they see those marvelous and beautiful water crystals. They did not expect water to have so many connotations. Dr. Cheng: Actually, in Chinese tradition, people had a meticulous understanding of water. For example, in creating medicine one must chose water carefully. To make Aijiao (a Chinese traditional medicine), water from a well called Ai in a village called Ai in Shandong Province must be used. Water for boiling tea was also carefully chosen. Some tea must be made with specific spring water, some must be made with dew from lotus leaves, other tea was prepared with snow from plum blossoms; another tea was yet prepared with the water from a certain segment of a certain river. All of these do not only prove that people in ancient China were refined and cultured; they also represented in-depth knowledge of the nature of water. In the countryside of China, women know a lot of simple but effective folk remedies. Among them, water is one of the most commonly used. For instance, when a child eats something not too well cooked, he or she will get a stomachache. Sometime the pain is so violent that the child rolls about on the ground. His mother will then heat a bowl of water to the point where it is just about to boil but not quite boiling yet. When the child is fed the water, the pain will be gone immediately, an instantaneous effect. Water usage among the people for different uses is numerous. An understanding of water is part of Chinese tradition from ancient times. Reporter: In the postscript of the book The Message from Water, the author raised several questions - where it comes from, where it goes, what is the purpose of existence, and others. How do you respond? Dr. Cheng: Instead of only focusing at the subject at hand, Dr. Emoto is able to jump out of the box and take on profound questions. It is an indication of his open-mindedness. Water is an essential factor in the creation of everything. To understand water also helps us to understand matter, spirit and life. 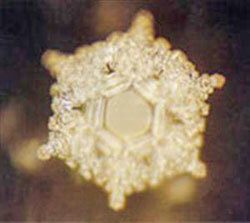 Masaru Emoto, “Messages from Water,” by Hado (Kyioku Sha) Publishing, Japan, 2000. 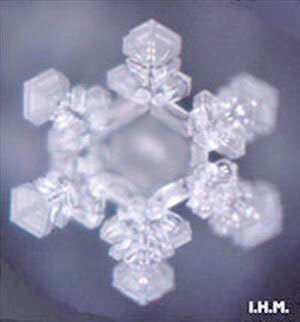 The water crystal experiments carried out by Dr. Masaru Emoto in Japan have produced enthusiastic responses among readers. We subsequently interviewed several people in scientific circles and invited them to talk about the significance of the experiments. Below is an interview with physicist Dr. Li Chunbing. We welcome everyone to join us to explore this fascinating experiment. Zhengjian Reporter: What do you think is the most important message from the experiment of “the message from water”? 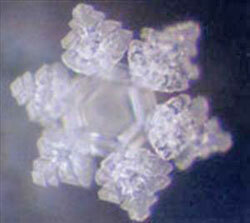 Dr. Li: The most spectacular part is that a water crystal can reflect “thought” with its formation. That is, a phrase, an image, or a piece of music can lead to particular shapes of water crystal. 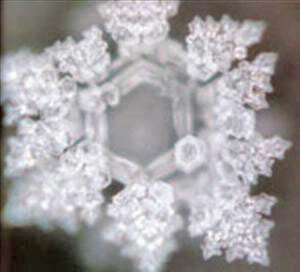 In other words, water responds to words, images, and sound with different formations of water crystal. 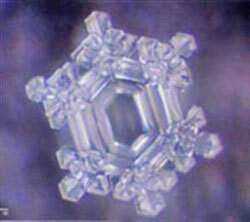 From the photographs of different formations of water crystal we can easily see that mind and matter are one thing. It appears that there is a mind inside a matter. For example, a word carries a thought, which manifest itself in the formation of water crystal in the water crystal experiments. This proves that a matter has life and thought of its own, and that a thought has its tangible representation. Matter and mind are one body with two kinds of manifestations of the same substance. In each experiment, the water has been exposed to different kinds of messages. Although each water crystal still shares the same chemical structure, they are actually different from one another in the thought and spirit they carry. These experiments have proven that water is a form of life, and this also applies to every word, every shape of object, and every single sound, for everything has a mind. Perhaps someday we will even be able to say hello to them once we have acquired higher abilities of observation. Reporter: A lot of photos of water crystals from the experiments have been published. Which photograph do you like best? 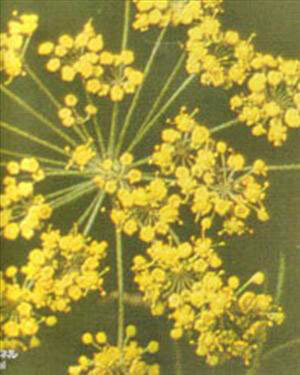 Dr. Li: The flower photos are inspiring. 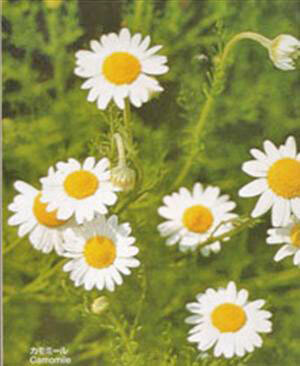 You can see that after being exposed to the pictures of chamomile and fennel, the formations of water crystals completely resemble the respective shapes of the two flowers. That a water crystal simulates the shape of a message it is exposed to is solid proof that every particle carries the whole image of a matter. Reporter: This experiment differs from other sophisticated science experiments in that very few specialists were involved but a world of attention was drawn to its results. What kind of impact do you think the experiment results will bring to the public? Dr. Li: We can see clearly from the experiment on water crystals that a kind thought makes things beautiful while an evil thought mutilates things. The greatest part of a human body and everything else in the world is made of water. It follows that our kind thoughts will improve the external environment, as well as ourselves. If we always keep kind thoughts, we will purify our own body, and thus become beautiful and healthy. If we always keep kind thoughts, we will also purify the environment and people around us. Our kind thoughts can improve everything in this world. It is mind-blowing to see this philosophy clearly in the water crystal experiments. The most direct way to purify the world is to keep kind thoughts. It would have a tremendous impact on the world if the public could see that point. Reporter: Dr. Masaru Emoto has already done an experiment where a group of people sent kind thoughts such as “thank you” and “love” to a bottle of severely polluted water. The water was purified quickly. In addition, Dr. Emoto has recently invited the whole world to send kind thoughts to water on earth at set times on a regular basis. What is your comment on these experiments? 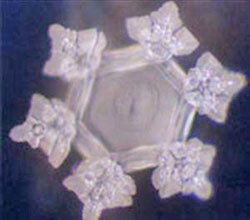 Dr. Li: Indeed, Dr. Emoto has conducted many experiments where a group of people sent kind thoughts to water together. This affectionate message was sent at the same time from 500 people all over Japan. The photo on the right was taken right afterwards. No man-made processing was done to this photograph at all. Even though the research team had expected this result, all the members of the team were moved to tears when they saw the photograph. The photograph on the left was taken three days after an earthquake occurred in Kobe, Japan. 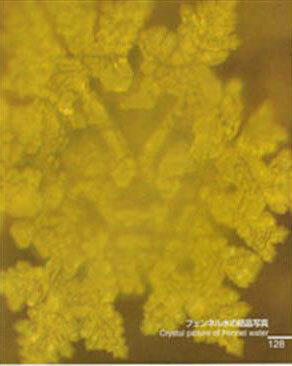 It was a deformed water crystal from tap water in Kobe. The water seems to express in mutilation the feelings of panic, grief and terror that the local people experienced during the earthquake. Everyone who has seen the photograph was shocked to see the feelings expressed by water. Yet people in Kobe received a wealth of concern and help from their fellow citizens on Earth afterwards. Three months after the earthquake, the research team took another photograph of the same bottle of water (shown on the right), which then expressed the same beauty as that in the blessings and concern toward people in Kobe, Japan. 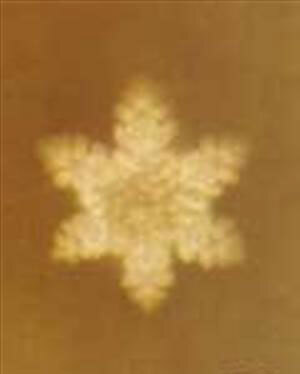 Dr. Emoto often tells a story of a group of people sending kind thoughts together. When Apollo 13 landed on the moon, the crew experienced some technical problems that caused damage to their oxygen tanks. They were not supposed to be able to make it back to earth alive under the circumstances. However, the entire world watched the expedition and prayed for them. In the end, the crew made it back to earth safely. Dr. Emoto believes that it was the work of sending kind thoughts as a group. Dr. Emoto regards it as a global activity where the world, regardless of race, belief, and country, sent benevolent thoughts together simultaneously. It follows that collective benevolent thoughts are very powerful. If we combat a calamity with kind thoughts as a group, the calamity will be dissolved. When it comes to destruction, violence and slaughter that plagues this world, we are able to stop them if we send benevolent thoughts to eliminate them. Reporter: Do you see any potential area for further exploration? Dr. Li: Although I don’t have an insider’s view of the experiments, I think the mind activities of the research team may influence the results of each experiment. Since water is found to be sensitive to thought, it must also be sensitive to the thought of the researchers. I believe that the researchers would need to keep a clear mind to avoid shaping the results to their likings. On the other hand, if we keep our mind peaceful, I believe the water that surrounds us will become very clean. I think the clarity of water will reflect the clarity of our tranquility. If we sit in meditation in a high level of tranquility, we should have more impact on water. Here, I would like to explain quickly that there are different levels of tranquility. The process of eliminating interfering thoughts and attaining a higher level of tranquility is essentially a process of cultivation. I would bet that the experimental results would be astonishing if a genuine cultivator sits in meditation next to a brook. I would also like to add a comment on the activities where a group of people send benevolent thoughts together. These activities are short-lived and, hence, yield temporary results. It is more important that we keep benevolent thoughts at all times because each of our thoughts influences our body and everything that surrounds us. It is only when we continue to eliminate bad thoughts, discipline ourselves with high moral standards, and learn to lead peaceful lives will we be able to purify our own bodies and our environments, as well as to attain and maintain world peace. This is the true way of life taught by the saint. A Chinese proverb says, “Water is a mirror of the heart.” From Dr. Emoto’s experiments, we now have a clear understanding that pure water is a product of a pure mind. A mind that resists kind thoughts has no power to improve water. It follows that group activities of sending benevolent thoughts can improve the environment on a small scale -- temporarily. The overall environment can be improved only when everyone embraces benevolence and enhances moral values. Now we have seen how a benevolent thought is capable of purifying water. The next subject in our discussion will be how to purify a mind. 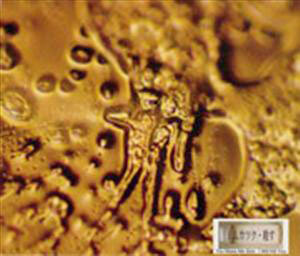 When I casually browsed the book Messages from Water, I was struck by the marvelous photographs of hexagonal crystals. Some crystals were clear and some were hazy, some were intricate and some were simple. The photographs appeared almost three-dimensional, new and different, and very pleasing to my eyes. At the first glance, the photographs appeared to be the masterful work of a great photographer. However, when one looks closely at the captions of the photographs, one will see that the photographs are results of a scientific experiment. 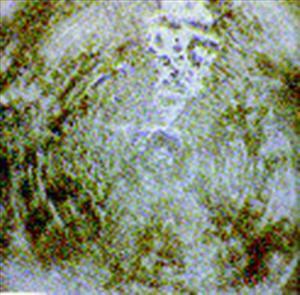 They were the snapshots of water crystallization taken under a microscope by the author Dr. Masaru Emoto, head of the Hado Institute (IHM Corporation) in Tokyo, and his research team. While in a laboratory set to –5ºC, an experimenter takes out a glass container from a refrigerator and quickly puts it under a microscope which has a camera mounted to it. A drop of water that has been exposed to a unique mind-intent, or a language, or a form of music, or a word, or a physical factor is placed in the container, which becomes frozen and form a small ice hummock. When the light from the microscope shines on it, it causes the ice to start to melt. At the top of the ice hummock, a water crystal is quickly formed which can only survive for a few seconds. The biggest challenge for the experimenters is to focus the camera rapidly enough to capture the beautiful image. As we can see, the approach used is quite straightforward. For a given set of the test environment, the researchers would conduct the same experiment on approximately ten to a hundred different water samples and then do statistical analysis on them. 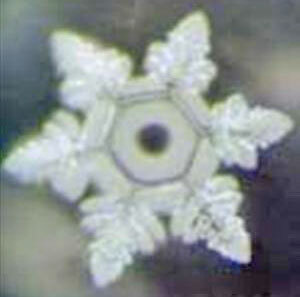 The photographs of water crystals shown in the book are the most representative of the results obtained. In the experiments, the response of water when exposed to different mind-intents, languages, forms of music, words, physical factors (such as vibrations, microwaves, electro-magnetic waves, etc.) and many other factors have been systematically observed. They are diverse and vivid. The results are so astonishing and wondrous. For example, water samples taken from a lake after an earthquake had just occurred were not able to produce crystals at all. 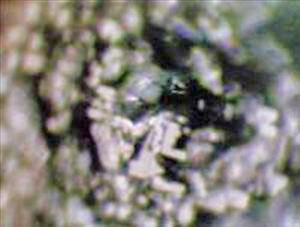 However, after some people said a prayer, the water samples were again able to produce crystals. In another experiment, when the same word, such as “wisdom,” was written in different languages and then placed on the labels of different water sample containers, the water crystals produced had the same shape and structure. The water taken from containers that had good words such as “love” and “thank you” placed on them produced marvelously brilliant crystals, while the water taken from containers with the bad words such as “hatred” and “demon” on them made extremely horrifying and ugly water crystals. Another amazing discovery is that when a piece of ice is just about to melt, the crystal formed looks the same as the Chinese character for water. The experiments are enough to make us sigh in wonder and ask ourselves how little we know about water. How can water respond to the different emotions and feelings of humans? Is it possible that water has sensory functions and the ability to change according to its environment? Can water distinguish good from evil, beauty from ugliness? If it can, how does it do it? What is the real origin of water? Are there common universal messages that go beyond words and language? Life cannot exist without water. If water is able to sense things, do we need to re-examine our understanding of life all over again? How should we use this knowledge to improve the quality of our lives? Those questions seem to go beyond what the so-called mainstream contemporary science can answer. With the current notions of science, it is difficult to explain how it’s possible that emotions, words, prayers and so on can affect the crystallization of water. There seems to be ways to improve the experiment. The process of crystallization is on a microscopic level and disappears in the twinkling of eye. If the whole crystallization process is shot with a video camera instead of the several still photographs taken from a camera, the results would be more convincing. Furthermore, scientists might start to ask different questions. One question is what kind of transformations are taking place on a physical and chemical level by those emotions, words, mind-intents and so on that can affect water crystallization. Perhaps doing more research in these areas will allow us to better understand the water crystal experiments. In turn, it might breakthrough some of the outdated and rigid mindsets scientists have currently. However, Dr. Masaru Emoto has no interest in trying to gain more acceptance from the community of mainstream science since what he has realized from his experiments has broadened his vision. It is obvious that he has raised the significance of his series of experiments to a very high level. When I met Dr. Masaru Emoto in Boston last year, he clearly stated that he had no intention of getting into a debate with the community of mainstream science. Instead, he wants to disseminate the knowledge to people in society so that the public and the younger generations will realize that kind thoughts such as love and thanks can make changes to water and the environment around us. 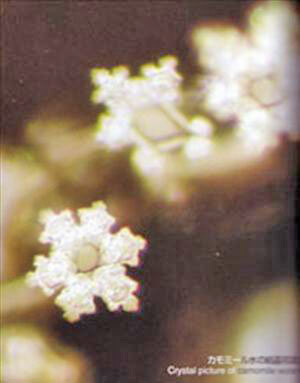 Dr. Masaru Emoto is invited to many countries to present his research discoveries and philosophical thoughts. He acts as a messenger using his unique perspective to bring forth love in human beings. He has initiated a global activity called “Expressing Our Love and Thanks to Water.” He hopes to change the quality of water and purify the Earth’s water resources through people’s kind intentions. After referring to the mysterious Mayan calendar and prophecy, he has declared July 25th 2003 as the global commemoration day for this activity. In fact when people can treat water, the source of life, with love and thanks, is it only the water that people will improve? 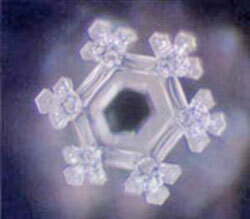 The significance of the water crystal experiments will transcend the imagination of everyone.